I’ve learned some things after being a mother for over two years. I wouldn’t say I’m an expert because I did spend more time in college than I have raising a child. But there are some lessons you learn rather quickly, and sometimes not in the easiest of circumstances. There is no room for judgement. I used to be one of those women who constantly looked at moms in the grocery store or at restaurants and thought “when I’m a mom I won’t _____.” But oh how much humble pie I have chowed down on since becoming a mom. And there is constantly a choice whether to fight a battle or not. Currently we are stuck in the “only eats hot dogs and chicken nuggets” stage. Why am I allowing my two-year-old to eat like a frat boy? Well because that’s a battle I’m not ready to fight every night. I once had a mom tell me that she is constantly fighting with her toddlers because she picks out their clothes everyday and likes them to coordnate. Girl, you do you, but I cannot even. Sometimes my son goes out into public in his pajamas and cowboy boots because hell hath no fury like a toddler scorned because we said “no” to his $15 cowboy boots from Walmart. Most days are survival of the fittest. And yet somehow I’m still here. But really why don’t parenting classes prepare you for how to juggle a crying infant while putting a toddler into his rear-facing carseat. I was a teacher for goodness sakes. Shouldn’t raising two children be easier than teaching a classroom full of children? You have to wake up every morning and do it all over again. I don’t even know what that number means other than a crap ton of minutes. And that’s only if your children leave the house at 18 years old. But since my children were born in the fall, I’ll have them until they’re almost 19. I kid. I kid. But really I’m drinking some right now. Why? Because I walked around Target for two hours with two kids just to get some steps in only to find I left my Fitbit on the charger because I have mom-brain and can hardly remember what zipcode I reside in let alone to put on every part of my outfit. You’re welcome, World, that I wore pants today. Then we came home just in time for the fight that is naptime. 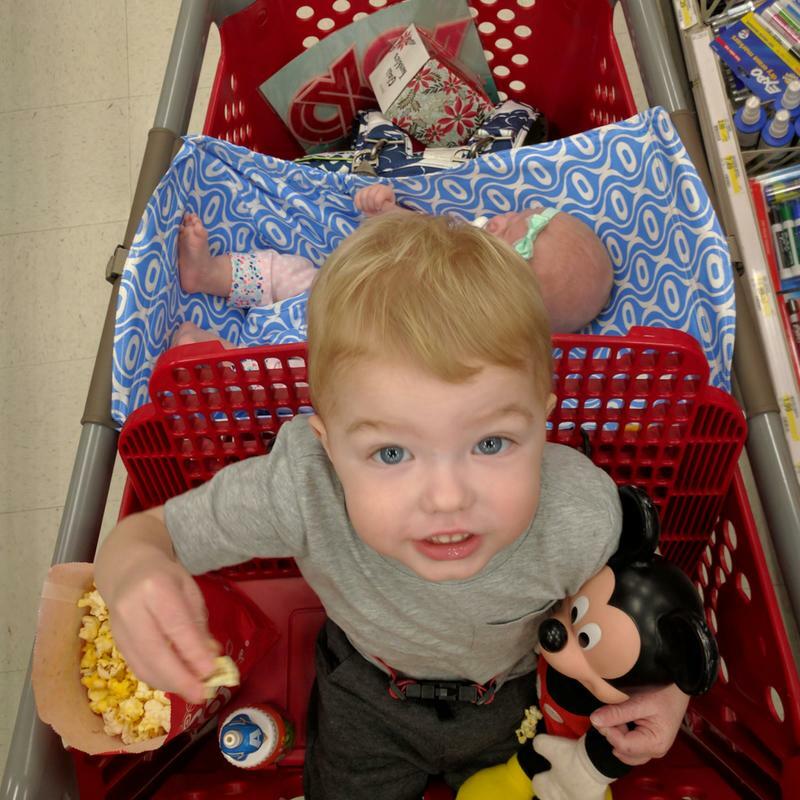 Now it’s 6:15pm and I fed my toddler two hot dogs tonight because all he had for lunch was popcorn in the grocery cart at Target, and half it was use to make a Hansel and Gretel style trail through Target. That is why I drink wine. Some days you win at motherhood and sometimes you only earn a paticipation trophy for waking up at all. Today was one of those days. Tomorrow might be too. But one of these days is going to be an almost perfect one. Then I’ll celebrate with wine. You’ll experience more love than you ever thought existed. How can one minute your child be screaming at you because he’s mad about God knows what and the next minute he’s telling you how much he loves you through all his tears? Bedtime will be the most glorious time of the day. Yes, because it is the time you’ve been working so hard for all day, but also because that is when your children give you the most hugs and kisses. And every time your child learns something new, you’ll realize just how great this motherhood thing is. Without fail, most nights you’ll crawl into bed and want to go to the bedroom next door and wake up your kids because you miss them so much. But don’t worry, chances are they’ll wake up before the sun rises, screaming about how they want you to come take their favorite stuffed animal out of the bed because they can’t just freaking throw it out themselves. That may sound oddly specific, or maybe you just don’t have a two-year-old yet. The day I discovered bribery via popcorn in Target was the day I earned a mom badge.